Once you have learned how to make mozzarella cheese you are in for an incredible homemade treat that will taste better than anything you can purchase at the supermarket. Although the process will take a few hours, the steps are relatively simple and the results are worth all of your time and effort. The most important thing is to find the best whole milk possible. Milk from water buffaloes makes the best mozzarella but, because this is difficult to find, look for local cow's milk that has not been homogenized. Homogenizing milk makes it almost impossible to make good mozzarella cheese. Unpasteurized milk is also preferred, but difficult to find unless you live near a dairy producing area. Pour the milk into a stainless steel pot over low heat. Stir in the citric acid and slowly heat the milk to 95 degrees F.
Take the milk off the heat and stir in the dissolved rennet or liquid rennet. Stir continuously for 30 seconds and then let the milk sit for three minutes without stirring. During this period the curds will separate from the whey. While still in the pot, run a sharp knife through the curds horizontally and vertically into 1/2-inch cubes, making certain to cut all the way to the bottom of the pot. At this point place your pot into a sink full of hot water and wait until the temperature of the milk is approximately 98 degrees F, stirring the curd gently for about 15 minutes. After it reaches the correct temperature, continue to stir the curds for about 20 more minutes. Line a large colander with cheesecloth and gently spoon the curds into the colander, draining as much of the whey as possible from the curds. Drain the curds for 15 minutes and then tie the ends of the cheesecloth together and hang over a bowl or a sink to drain for another 10 minutes. Put this mass of curds into a large bowl and cut into 1/2-inch slices, then cut the slices into strips. Put about one quarter of the curd strips into a microwave-safe bowl and heat until the curds begin to melt. Remove the cheese from the microwave and start kneading the cheese with your hands until it comes together like a bread dough. While kneading, add a pinch of salt. When the cheese begins to form a ball, shape it into a nice, neat round shape until the outside is smooth and shiny. Transfer to another bowl filled with salted ice water (about two teaspoons of salt to one cup of water) and let sit until it cools and is ready to eat. Follow the same directions to form a total of four mozzarella balls. When kneading, work the cheese as little as possible, and stretch the curds before you shape them into a ball. Cooking the curds at a higher temperature will result in a drier mozzarella. The lower the heat the more moist your cheese will become. When working with the curds, don't squeeze the curd or all of the wonderful cream will ooze out. Top sliced and toasted French bread with mozzarella and tapenade. 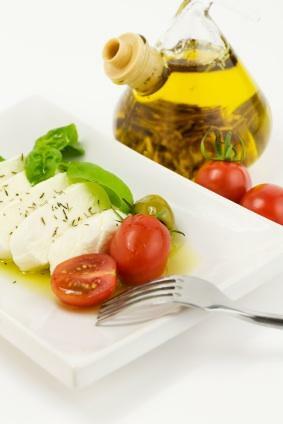 Make a fresh salad out of small cubes of mozzarella, basil, tomatoes and drizzle with a little olive oil and finish with salt and pepper. Add to sandwiches, burgers and pizza. Bread and fry for a homemade twist on cheese sticks.